I have had “miniature” Australian Shepherds as pets, travel companions and training partners since the mid 1980’s. At the time my first Aussie came to live with me, the term “miniature” was not prevalent in the vocabulary of the Aussie world, at least not in this part of the country. An Aussie was an Aussie was an Aussie and some were bigger than others. 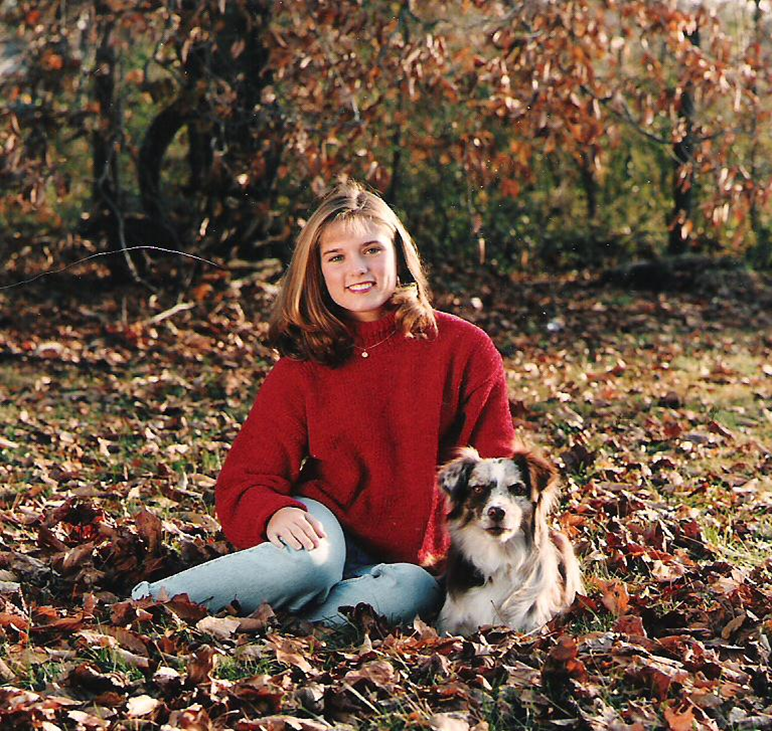 My first Australian Shepherd was a red merle female registered with National Stock Dog Registry. She stood 17 inches at the shoulder and weighed about 28 pounds. Patch was a beautiful girl with bright colors and excellent bone structure, but I had no idea how nice she was at the time because the breed was new to me and we just loved her for who she was. I also had no idea that because of her height of less than 18″ that she fit into the size specifications of a Mini Aussie. Up until the time Patch came to live with us, we had larger working Border Collies on our farm out of the dogs produced by Harold Miller here in Kentucky. Mr. Miller, along with his son, are well known for their herding demonstrations at the Kentucky State Fair each year. My dad and my young son went to visit a local farmer to pick out a little Aussie puppy and came home with Patch, a bundle of red mottled fur. My dad brought her to my house for me to do some obedience work with her and to keep her until she was old enough to work the cattle as he had done with his other BC pups. Well, Patch lived with us for over 16 years…in the house, in our bed, in the motorhome…coddled. She definitely had the instinct to herd and would have been voracious enough to move those big Angus bulls, but she never had to work that hard nor risk her teeth or life in the barn lot. Patch’s sire and dam were from an Indiana breeder and I have searched to determine her pedigree. Her breeder no longer have papers on the parents so I have not been able to trace her lineage although I have tried through the registry service. It is dogs of Patch’s size that have been selectively line bred by a few breeders, primarily in the Northwest over the course of several generations, to reduce the size of the Australian Shepherd creating the height categories that are recognized today. This pattern of breeding small to small does create a bit of a problem when breeders are asked to guarantee the adult size of the Miniature Aussie puppy they are about to purchase. We use the term “throw back” when referring to the Aussie heritage of having larger dogs in the bloodlines in earlier generations. That occasional size discrepancy in an otherwise standardized litter is reminiscent of great great grandpa or grandma contributing their genetic imprint to the current generation much as one of our children can carry forward a characteristic of one of their ancestors. The size is basically unimportant other than convenience because the personality and intelligence of an Aussie, Standard, Miniature or Toy are top notch. They are excellent house pets, wonderful hiking companions, and they love to work when it is time to train obedience, agility, flyball or the activity of your choice. Aussies, regardless the size, live to please! There are just those times when “stuff happens”. A friend of mine teases me about having a backup plan, but when we have dogs or other pets, a plan of action in place is very important for their safety if we have an emergency and have to be away. Just recently, my husband became ill and the visit to the ER turned into a stay in the hospital which is not unusual. Since I have 6 dogs, I have a person that pet sits for me on a regular basis and knows my dogs, my house systems and my routine well. That is part of my backup plan so she was able to pick right up with a last minute call to fill in for me until we returned. It isn’t always easy to find that reliable person that is available or willing to care for our animals when we are away. Using a neighbor isn’t usually a good idea although they might pinch hit in an extreme situation. They have their own lives and imposing on their hospitality can lead to them avoiding us. Plus, although being friendly and helpful, they may not be the right person to be on schedule to let the dogs out or may not follow our directions on feeding, sometimes leading to a dog escaping or damage to our house or even causing illness to the pet. As a part of that backup plan, have it in place before you need it. People that “pet sit” for a business are your best bet because they are usually insured and know how to follow your directions and are usually on call once you have established a relationship. An Internet search will typically locate petsitters in your area or often you can use websites like www.petsit.com or www.petsits.com to find a reliable person. Personally, I would avoid Craigslist ads. Expect to pay. The old adage “you get what you pay for”, is most often true. Asking someone to care for your animals for free is not a backup plan. Knowing there is no payout, the psyche tells them they can do it their way instead of your way. Be careful of using children or even teenagers. Children, although they might love your dog, do not have the judgment to deal with emergencies appropriately and it is likely they won’t be there for that early morning potty break to be sure your house isn’t soiled or keeping dogs separated for feeding to prevent a scuffle. Teenagers, on the other hand, can (but not necessarily) be more reliable but an empty house + teenagers could lead to trouble. Even so, most 16 year olds won’t be up at 6 am to let the dogs out and they might not realize the importance of not missing a visit. Get your plan in place early. Find the sitter, fill out the paperwork, check their insurance and reviews, and have them do a visit occasionally on one of your shopping days to be sure it goes well and the pets get to know them. Then, check in with them routinely to be sure they are still in business and keep them up to date on changes you might have or changes to locks. That backup plan will give you peace of mind when the Emergency Room beckons or you decide last minute to fly to Las Vegas for a weekend of the awesome buffets! Plan ahead for your pets to keep them safe while you are away because “stuff happens”!!!! 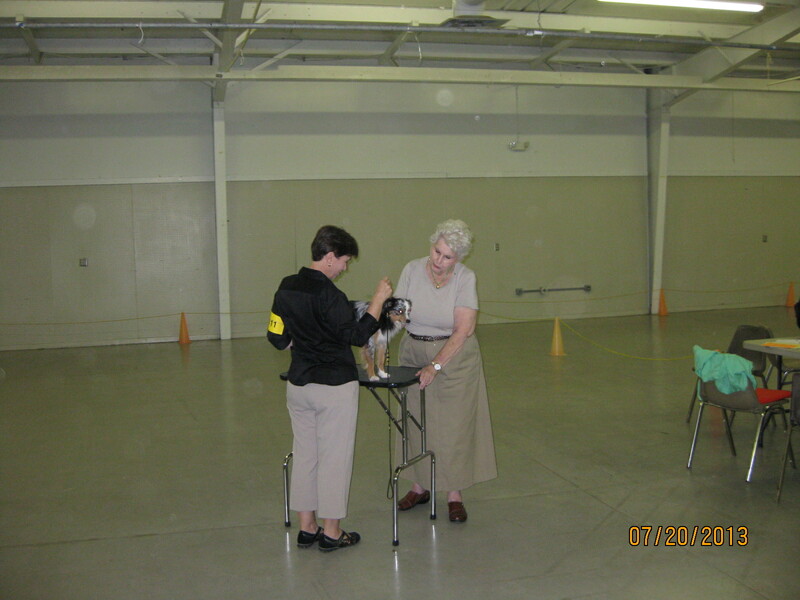 Finding training treats for our puppies and dogs is sometimes difficult. We try to avoid items produced off shore, we try to avoid treats with sugar and added “stuff” and we look for low calorie for those of our dogs that have a tendency to be chubby. And..cost is a factor as well. That just doesn’t leave very many to select from. An easy and very inexpensive alternative to commercial training treats is dehydrated beef liver. It is extremely inexpensive at the discount grocery store not far from me and comes packaged frozen and neatly sliced so I don’t even have to touch it. I thaw the meat, open the package, slide the slices over onto a baking sheet in a single layer and bake at 200 degrees for 2 1/2-3 hours. Sometime I turn the liver over midway, sometimes not. 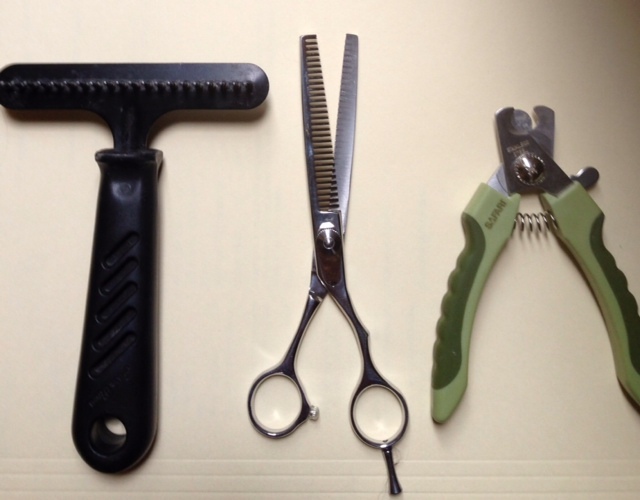 Once totally cooled, I use my kitchen scissors to cut into tiny little pieces for storage. Since my dogs are small and I like to keep it fresh, I usually divide the batch into 3 zip lock bags and freeze 2 of them and leave one in the refrigerator to use within a week or so. Although a controversial subject in some circles, I’d like to answer the question “What is the difference in a Miniature Australian Shepherd and a Miniature American Shepherd?” in my own words. Originally, Australian Shepherds were bred as working dogs and used by immigrant shepherds in the northwest US. Ranchers were looking for their best dogs with strong herding instinct and drive so what we now see as Australian Shepherds most likely looked very different in the early 1800’s, even from place to place. Utility, not appearance, was the goal for those shepherds and their dogs. Over time, the breed became more standardized and was accepted by American Kennel Club as a distinct dog breed in 1991. AKC currently lists their breed standard for an Australian Shepherd at 18″-23″ at the shoulders (withers). I find it interesting that I have a picture of my grandparents along with my father and his two brothers in a family group standing with their farm dog that looks very similar to a red tri Aussie taken in the late 1930’s in Kentucky. Between the “then” and “now”, a few motivated breeders whose kennel names are found in the majority of the Mini Aussie foundation bloodlines, started to breed small to small to get a more compact dog. 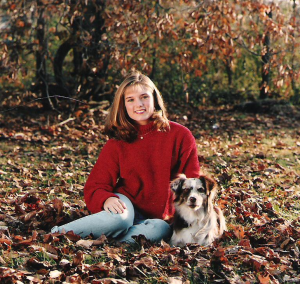 In the late 1980’s, my father brought me a little red merle female registered Australian Shepherd to “keep” until she was old enough to work his Black Angus cattle. Patch, as we called her, stood about 16″ and weighed 28 pounds as an adult. She was undoubtedly an Aussie, but in today’s measurements would be called a Mini. I can imagine that with time her progeny could have been reduced much further in height over a few generations. By the way, that pup that I was to babysit and give some basic obedience shared my house for the next 16 1/2 years and didn’t muddy her feet in the barn lot. Instead, she was our house dog and protector, herding any stray boyfriends back to their cars with a nip on the behind! Since AKC limited their standard size to the Aussie, those smaller dogs took on a life of their own and folks started to call them Mini Aussies. As people do, a division line in the sand was drawn and the die hard Aussie folks took a serious dislike to the smaller versions. National Stock Dog Registry who had previously registered working Border Collies before they were accepted by AKC (another story), Australian Shepherds and also the old breed of English Shepherds begin to register and keep records for pedigrees on the Mini Aussie and listed their size as between 14-18″. 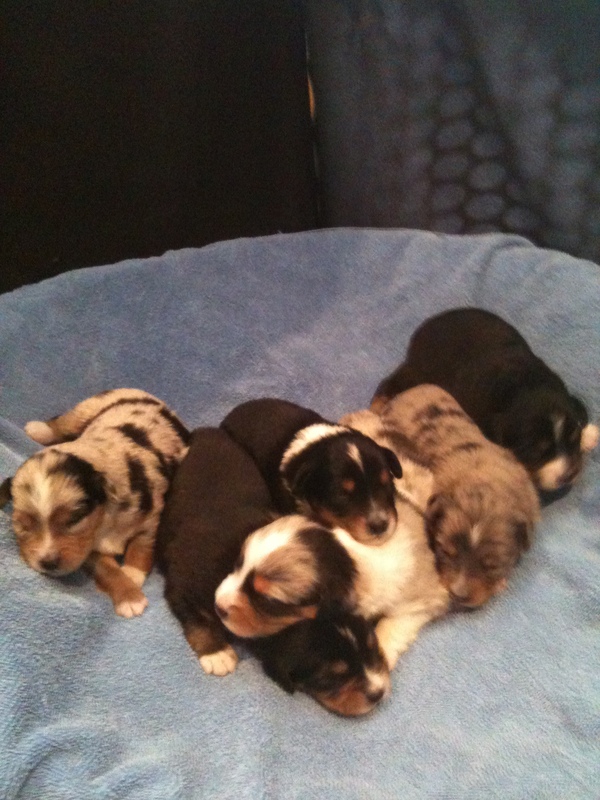 At that point and even now, you find AKC registered Australian Shepherds in the bloodlines of the Minis. Now back to the question, what is the difference between a Mini Aussie and a Mini Ameri? Again, this is my words, and please no flaming! There is not one iota of difference except the verbage. North American Miniature Australian Shepherd Club of USA (NAMASCUSA) became the home club for the Mini Aussie and sought recognition by AKC for them to be an accepted breed for conformation showing in that venue. Over a period of time and with much debate and deliberation, AKC allowed the Mini Aussie to join the ranks as AKC Foundation Stock Service (new developing breed) with some caveats. The Australian Shepherd folks still had their line in the sand and wouldn’t back down on the Mini being an offshoot of their breed standard, so to be accepted, the NAMASCUSA Mini Aussie folks agreed to change the name and a few revisions to the breed standard wording including the size range 13″-18″. 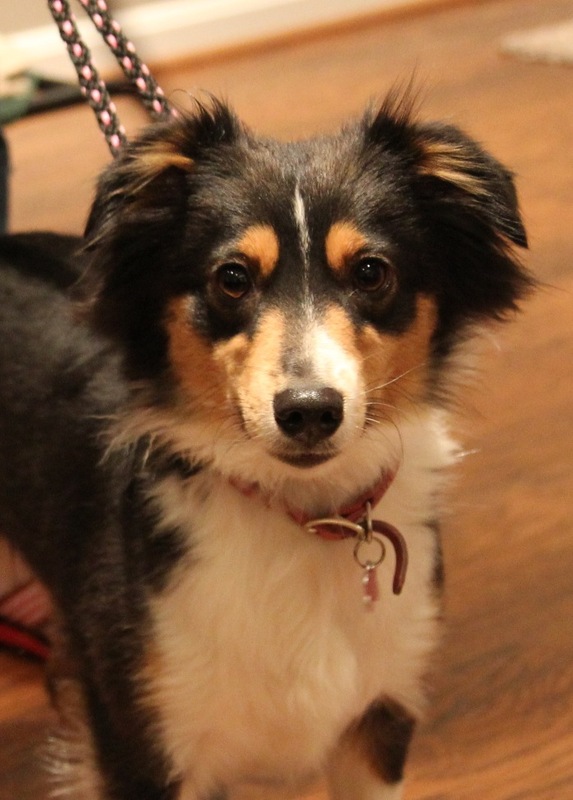 A vote of the members chose Miniature American Shepherd as the official breed name. Within the next year, the Mini Ameri will have passed the “trial by fire” as FSS and be added to the AKC ranks with full rights and privileges. As humans do, once again, another line was drawn in the sand. 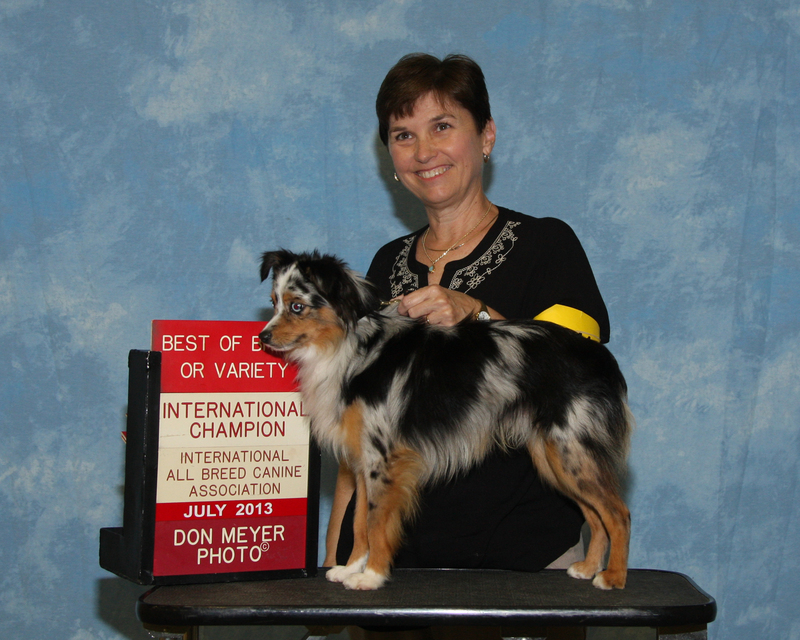 There are many Mini Aussie breeders who are determined to keep the name “Mini Aussie” and others who think the benefits of being AKC recognized was worth a name change. During this transition time, any Mini Aussie that is registered with National Stock Dog Registry can also be registered with AKC FSS as a Mini Ameri, thus having dual names and dual registration. Those that drew the line against AKC have mostly moved their registrations to American Stock Dog Registry (ASDR). At this point and probably forever, the two will continually cross pedigrees. For example, in the case of my dogs, the pedigrees include dogs registered as AKC Standard Aussies, ones registered NSDR as Mini Aussies and some of the younger ones also ASDR as Mini Aussies. Because the general public doesn’t know or care about all the background, I still for the most part call my dogs Mini Aussies. 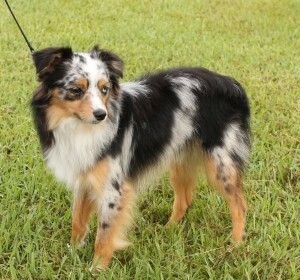 When I talk to other breeders, I more likely use the Miniature American Shepherd name. What is the difference? In my house, one day a Mini Aussie..sign a registration form and the next day a Mini Ameri! The dog is the same, the pedigree is the same, the snuggles are the same….so no difference! I do a lot of corresponding with folks by phone, email and Facebook that are shopping for “the puppy” that they would like to bring home with them and I am reminded that a puppy is a long term commitment, not one to be taken lightly. With that in mind, I am drawing from one of my old posts about the parallel importance of shopping for a breeder along with shopping for a puppy. In our digital age where we can talk online to folks all over the country and world and see what they want us to see, and no more, it is even more important to do due diligence in our searches and to ask the right questions and make the correct observations when buying a dog. None of us want to feed the fodder to a person that is running a puppy mill operation. As consumers, we are the best police for those folks. If they have no customers, it is no longer profitable for them to run their business. How do you know you are buying a puppy from a reputable breeder? What questions should you ask? How do you determine if the person you are talking to is giving you straight answers? After making initial contact, try to speak on the phone to the person to get a feel for their personality. Do they have time to talk to you? Are they evasive or forthcoming when you ask relevant questions? Go with the gut. Look at the dog’s pedigree. Even if buying a companion puppy, it is a plus to see some titled dogs in the bloodlines which indicates adherence to breed standard. Pictures of other dogs in the line are helpful to see what the genetics behind the puppies predicts. Ask to see the sire and dam’s registration papers if you wish to register your puppy. Know the different venues for registration for the particular breed you choose. If the dogs have been health tested, ask for the paperwork. Not every health item is life threatening and some have little to no effect on companion puppies, but the breeder should be open and discuss what they mean to you, as a buyer. Ask the name of the breeder’s veterinarian and call the office for a reference. Ask how often they see the breeder in their vet office for routine care. Do not be afraid to inquire about the care the breeder gives their adults dogs. Do they have their teeth cleaned, do they get regular vaccinations, what is the dog’s condition when they come in for exam, etc? Check out Yahoo Local or Angie’s List for comments from previous buyers of puppies. You can also ask the breeder for references and make those phone calls. If you ask the right questions, you can get a feel for what the previous puppies from the breeder are like. Ask about membership in breed organizations and check it out. Google the person’s name and state. Watch for any criminal activity or complaints that might crop up online. And if you can, make a personal connection with the breeder by visiting their adult dogs and seeing their house. When visiting someone’s home, it is quite easy to see the environment in which the dogs live. I have a strong opinion that if a breeder does not want me to see their dogs or where their dogs live, there must be a reason. That’s not always possible if you are making a purchase out of state, but just be careful and diligent. With our technology, virtual real time tours are very easy and valuable. Contrary to the belief of the general public and implications of the media, reputable hobby breeders do not net a large amount of money. Health testing, feeding quality food, routine health care, and showing and competition are expensive and time consuming endeavors. Reputable breeders typically charge higher prices than those pumping out puppies in the barn to cover those costs and to guarantee a healthy animal. For most of us, we love our breed and breeding a few litters a year is just fun and we enjoy the extended relationships with the buyers of our puppies and watching the puppies mature to become loved companions. Puppy mills should be stopped when the health and welfare of the animals are being sacrificed for profit. The Law of Supply and Demand will help to control and eliminate the bad apples if puppy buyers will do their homework. Ask the right questions and consider the answers you find when shopping for a new puppy. Since my last post, I am still sold on using a litter box for potty training puppies and giving them an alternative potty place when no one is home to let them outside. The management and cleanliness over the other methods I have used is much superior. I have evaluated three different kinds of litter for the puppies and two containers and would like to share my experience for my puppy buyers and also for breeders that may be considering this method of potty training. Pros: Room for puppies to move around a bit, contains litter very well with 6″ sides. Easy to clean. Easy to use small dustpan to scoop litter out to garbage for emptying. Cons: Puppies with very short legs had trouble scaling the side to get in but once they were 5 weeks old and learned to hop over, no issues. Container is heavy when filled. Pros: Shallow for ease of entry and exit. Contained litter well. Cons: Little boys found they could stand with front feet inside, back legs outside the container for peepee. No problems on poopies. Cons: Pellets were not as compact and bags contained some sawdust from purchase. Pros: Pups did not try to eat the pellets. Turned to sawdust when wet. Minimal smell. Liquid seemed to “disappear” with no dampness in bottom of tray. Pellets were very compressed with no sawdust in bag. $5.00 for 40 pound bag. Made of compressed wood sawdust so biodegradable. Minimal tracking. Easy to scoop solids with cat litter scoop. Cons: I didn’t find any cons unless you are allergic to the wood source, a non issue for me. Pros: Non allergenic because made of compressed newspaper. Minimal to no smell. No tracking. Easy to scoop solids with cat litter scoop. Cons: Pups liked to carry the pellets around and chew on them (at 6 weeks old). $17 per 18 pound bag. Paper absorbed the urine rather than changing form. Evaluation: For a litter of six puppies, starting at 3-4 weeks old, the combination of under bed box and rabbit hutch tray has been sufficient for containers for litter box training. Long term as a puppy grows, I would prefer the under bed box. My choice of puppy litter is the horse bedding pellets from Tractor Supply both for practicality and cleanliness and price. The textures of the 3 kinds of pellets are similar, so it is easy to transfer from one to the other and is a matter of preference and price. This new litter of Mini Aussie/ Mini American Shepherd puppies has been my trial run for litter box training and I am sold that it works much better than any other method I have tried. Previously, I have used disposable pee pads and washable pee pads, the latter being the best of those two methods. However, I learned that the washable pee pads sometimes led the puppies to believe it was okay for them to potty on their owner’s rugs since the fabric texture was what their feet were searching for as a potty area. The litter is like nothing else found in our home environment so they can’t be confused about what is “okay”. I have a series of YouTube videos on litter training for anyone interested but thought I would outline the steps I have taken that have worked very well. As a retired teacher, I always have the desire to learn and also to teach. As I was researching litter box training for dogs, I found very little worthwhile information with sequential steps from puppy hood. Mostly folks show a picture of their final setup with a dog walking in to the box to potty. Well, how did they get to that point?? When my puppies are born, they sleep with their dam in a Perla bed which keeps them contained in a safe and warm environment. For the first 2-2 1/2 weeks they are unable to move out of that area and their mama dog keeps them clean and neat so potty training is a moot point. However, once they open their eyes and ears, they start to explore and before long their little legs start to take them out into the big world around them. At the point that they are able to roll out of their Perla bed, I changed to the bottom half of a large plastic kennel lined with “vet bed” and left it open for the mama to come in and out. Across from the kennel bottom, I placed the other half of the kennel lined with bed pads that you find at the drug store or Walmart. I used a large clamp to hold the two together so there were no cracks for them to fall through. I gave them a ramp (rolled up towel) to toddle over into their bathroom area and gave them practice moving from one side to the other. I spend a lot of time with my puppies, so I tried to move them over and back many times during the day and before long they were starting to potty on the pad. Excellent–first step completed! 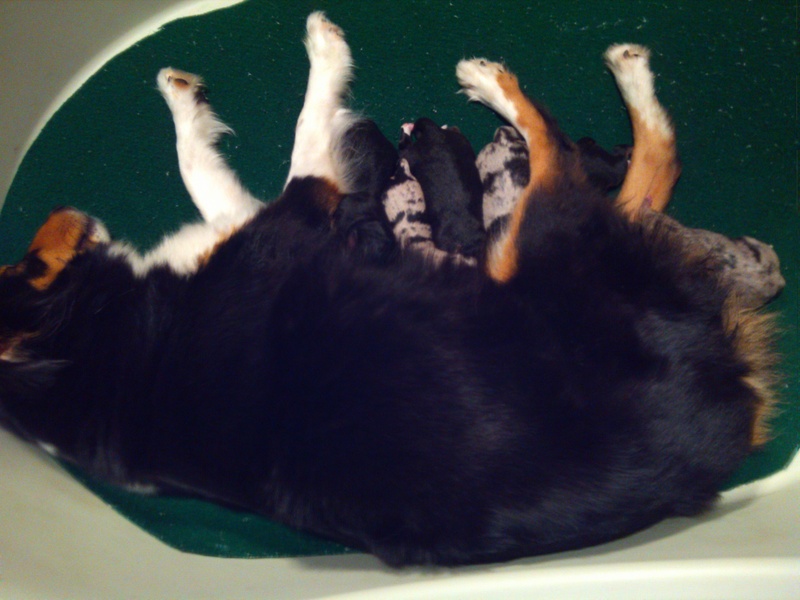 The good part was that the mama dog could jump in and out gingerly when she needed to and the puppies were contained. As the puppies have matured, they got some time out on the floor to play and explore, but when I wasn’t watching and during the night, I made sure the halves of the crate were clamped together so they had two options, sleep in their bed, or potty in their bathroom. Before long, I was waking up in the morning to their knowing the difference in the two areas. Slowly, I started to add the litter on top of the pee pad. At first it was very alien to the puppies and they weren’t sure what to do so I kept enough of the pad surface showing for their feet to feel what they were used to. This step, introduction of litter completed! Once the first bold puppy learned to topple out of the bed at night, I had to change out the plan once again. I added a Sterlite under the bed plastic box to the pen area with a pad and just some litter covering the pad and many times during the day moved the puppies into that area saying “go potty” and giving praise. I continued to keep the other kennel half with a pad and litter available as well so there were now two areas. As much as possible overnight, I contained the puppies in their bed using my Iris fencing along side so they still had two options, sleep or potty. During the day, I moved the fence outwards for play and eating areas along with their potty places. During this step, I continued to make the litter deeper but still having some pad showing in places. It was amazing for me to see them moving on their own to the litter box, especially for their number twos. Two of the babies had very short legs, so instead of getting a second Sterlite box, I took away the kennel bottom and added a plastic rabbit hutch tray again lined with a pad and litter. The short sides were easy to walk over and it was still large enough for the puppies to do their dance. At this stage the kennel area contained their bed, eating area, Sterlite litter box and rabbit hutch litter box. Lots more practice and by 4 weeks old, we are at nearly 100% on poops and 80% on peepees, which seem to be a little harder, especially right after napping. Some just can’t wait! In another week or so, my plan is to phase out the rabbit tray and add the second Sterlite box because two will fit perfectly across the back of my Iris pen area. I’m predicting to be in the high 90th percentile on everything by then and little legs will have lengthened to make it easy for everyone. I have continued to use the bed pads under the litter just because it is so easy to roll everything up and toss in the garbage. With six puppies, I like to change out the litter daily although I keep it scooped often. I’m thinking with just one puppy it wouldn’t be necessary to change the litter but occasionally, weekly maybe, and the pads won’t be necessary for the new owners. Why would you litter box train a puppy/dog? I am an advocate for teaching a puppy to go outside to do their business, but those first few months or even long term, there may be times when no one is home and rather than have a mess why not have a puppy trained to have a place to go and keep the owners happy. Overnight, it is also really nice during bad weather to have options if you don’t want to take the dog out. How will we transition? Easy! I am currently using wood stove pellets which are compressed sawdust and biodegradable. When the weather clears and the puppies are big enough to put on the ground, I will just put some of their litter out on the grass or garden area where I want them to learn to potty. They know the texture and the smell and will be drawn to the litter. Wood stove pellets are sold at home stores like Tractor Supply, 40 pounds for $5, which I have stored in a plastic garbage can. I doubt they are available during the summer, so it may be necessary to stock up. I have also been told that the pellets that are used for horse bedding are similar and perhaps more compressed so I will also try those and evaluate the difference. If wood stove pellets are not available, actual dog litter made from compressed newspaper is available at Petco and other big box stores, but for a substantially higher price. Cat litter should NOT be used because it could be ingested. In my experience, puppies do not eat the pellets which has also been a pleasant surprise. I am convinced that training new puppies to use a litter box will help the new owners and it certainly has made my life much easier and kept their area clean and neat. I’m a believer! Miniature Australian Shepherds Comments Off on Having a “Murray” Christmas! As always, an adventure is underway at our house, and Christmas 2013 was no different. After negotiating with our adult children, we came to the consensus that Paul and me and Fancy and her litter of six puppies would travel an hour and a half for our Christmas Eve dinner with them at my daughter’s house. The positive was that I didn’t have to cook as much and I didn’t have to clean as much. The downside was that it would be necessary for us to pack mama and the puppies in our motor home for the trek. Newborn puppies, although fairly hardy, need to be kept at a steady warm temperature to keep them from getting sick which is mostly impossible traveling in a vehicle, even our mini van. We needed some space for the Perla bed and power to keep the bed heater at a reliable temp. I did find by measuring the temperature of the bed over a two day period several years ago that it was necessary to include a reptile thermostat to cycle the Lectro-Kennel on and off to keep the temperature within the desired range. Without the thermostat, the temps were a little too hot which can be as bad for the puppies as them getting chilled. From day one until about two weeks have passed, I keep the puppies’ bed temp about 85-90 and ambient temperature at least 75. In the motor home, we were able to accomplish this by running our generator to power the bed heater and by running the gas furnace. Fancy loves to travel so she was all smiles to get to ride along on our holiday adventure. The rest of the crew stayed behind to play and ward off strangers that might consider our house a target. haha My wonderful pet sitter came by to give them a potty break and a yard run about mid way our trip. My pooches were starting to make those click click sounds as they run around on the hardwood floors which is a reminder that it is time for their nails to be trimmed…aka doggy pedicure. I am so fortunate because my pooches aren’t necessarily happy to have their nails clipped, but they don’t hold grudges and will stay still for me. The trick is that I started them all when they were tiny little furballs and always try to make it a happy occasion with yummy treats afterward. If you dog is fussier, a muzzle is a good idea and just take it slow. Once they learn that you aren’t giving in and it really doesn’t hurt, the next time will be easier. A good light is essential and I either put the dog on my grooming table or let them lay in my lap, depending on which gets more cooperation. There are different tools to use including a Dremel grinder, scissor style clippers or guillotine type. I do have a grinder and use it some to smooth off the rough edges, but for the most part I use clippers like the ones pictured mostly because it is faster and they have a safety to help gauge how far to cut. If the nail is a little too sharp on the edges, then I might grind them a bit or let them run around on the concrete driveway! It is recommended that nails be cut in small increments weekly so the “quick” will move back in their nail and make it less likely to cut too short and cause bleeding. I can’t say I do the trim that often, but I try to go no more than a couple of weeks. If you do cut the quick, be prepared for a big bleed that takes awhile to stop. It does hurt the dog some, but the worst part is keeping them still until the blood clots. I have stypic pads on hand just in case. Dog’s nails are either black or white or some of each. Definitely the white nails are much easier because you can see where the quick starts. I try to judge how much I cut off the white ones to know where to cut on the black since my dogs have some of each (weird, eh?). Good News–Puppies in the Oven! Alangus Aussies, Breeding Dogs, Choosing Veterinarian, Mini Aussie Puppies, Miniature American Shepherd, Miniature Australian Shepherds, Toy Australian Shepherd, Ultrasound Dogs Comments Off on Good News–Puppies in the Oven! Fancy had her ultrasound this morning and Dr. Ross at PeWee Veterinary Hospital saw 5 and perhaps 6 little heartbeats…so puppies are in the oven 🙂 Good job, Swagger Man!! Some breeders don’t take advantage of an ultrasound, but Dr. Ross has high tech equipment and reproductive veterinary medicine is her specialty so she is my go to vet for breeding and whelping help. She has been right on the money with my other litters, and I really like knowing if my girl has been bred so I can give her extra special care (as if my dogs aren’t always pampered!!!). I project the due date based on Fancy’s last litters as December 17-20. 2013. Fancy and Swagger most likely will have puppies in the 13-15″ range, although there can be exceptions to the rule due to genetics in the dogs behind them. I know that Fancy carries the gene for “red” which is recessive in Aussies and it will be interesting to see if Swagger also carries it. No doubt, the probability for black tri and blue merle puppies is high. Only time will tell…….that is part of the fun!! Check back in for progress reports. Join us on Facebook as well! 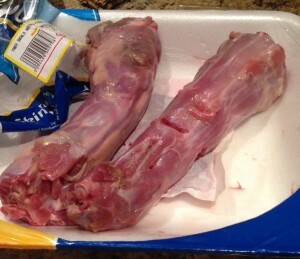 I was at my local Kroger shopping for a turkey breast to cook and was surprised to find raw turkey necks in the meat cooler along side the turkeys. What was I thinking, it is Thanksgiving season, after all! Since the price was WAY cheaper than the raw meat sold at my local pet store, I bought several packages and stuck them in the freezer for another sunny day when my dogs need to get their chewing fix. We are on the countdown from 63 days for Fancy x Swagger puppies. About midway, I will take her in for an ultrasound to determine how many there are. Fingers are crossed for puppies around December 17. I am currently accepting deposits on this litter. If I find Fancy was not bred this cycle, deposits will be refunded. This will be Fancy’s third litter, Swagger’s first. Both sire and dam have well known foundation Miniature Aussies in their pedigrees and multiple titled dogs. Even more importantly, Fancy has proven to stamp her puppies with her friendly temperament. Pedigrees are on my webpage at Swagger and Fancy. Videos of previous litters are on my Alangus Aussies YouTube Channel and puppy pictures from previous litters have been moved to Facebook. Kona aka Tardy from Fancy x Randy 2012 litter sending a shout out to her littermates: Brave, Petey, Kobe, Mari and Bentley. As always, I have strong opinions about choosing a veterinarian just as I am prejudiced when I choose a doctor for my own health. Luckily, I came to know the half dozen vet clinics in my area with all their strengths and weaknesses during the six years that I owned a pet sitting business. I had the advantage of recommendations from my clients and had contact with most of the offices as I made rounds to meet the staff or called for meds or advice when I had a sick dog or cat under my care. When asked by folks, “who do you use as a vet?”, my answer is “it depends on what I need”. I go to one for teeth cleaning and general health because I just like and trust her, one when I want an alternative to prescription meds because she is trained in Chinese alternative medicine, one for my puppy tail docking because she knows the breed standard and is consistent, another for reproductive issues because that is her expertise and a mobile vet that comes to my house for my puppy wellness checks before they leave my care. I just realized they are all women…too strange! 1–Does the vet talk to me? Do they have time to answer my questions? It is easy to tell if it is an “in and out” kind of office where number of clients is more important that good relationships. 2–Does the doctor practice good medicine? Do I trust them? Do they offer reasons why they are choosing the treatment options? Do they give me alternatives? 4–Do they require what I consider unnecessary tests before basic treatment is tried, seemingly to raise my bill? One of my favorite vets offers me advice on home remedies and holistic methods, often before giving a prescription or in addition to meds. 5–Is the office clean? No vet’s office is spotless, but clean enough is important. Sick dogs come and go and I don’t like to take in my healthy dog for shots and risk them coming out diseased. 6–Is the office staff efficient? It bugs me if the clerks are gossiping or eating lunch at their desk while ignoring folks that are waiting in line. Even worse is them snickering about clients behind their backs. 7–Is the vet coming to my house helpful? When I have puppies, it is much easier to pay an extra $25 to have the mobile vet come to me for shots and wellness checks. Typically, if my older dogs are also due immunizations, we may do that at the same time. 8–Does the vet like my breed and my dog specifically? And, does my dog like the vet? Our dogs do not forget a bad experience and luckily, the vets I use both like Mini Aussies and also like my pooches. The dogs can tell because they are not freaked out when we walk in the door. Nervous yes, freaked out..no. 9–Is the vet smart about nutrition? This is another one that is important to me. Since Science Diet is a sponsor of most veterinary schools, their products are on the shelves for sale. I also like to see higher quality grain free foods for sale and the doctor knowledgeable about grain allergies and sometimes particular protein intolerance in dogs. Just a side note, Swagger is doing excellent having eliminated dog food with chicken from his diet. My general purpose vet noted that on his chart recently and we talked about it at length. It is not uncommon but sometimes difficult to detect. 10–Does the vet have good techs? After all, the techs do a lot of the routine work like nurses in our hospitals, so they need to also have expertise at both their jobs and also be good at handling the dog patients. 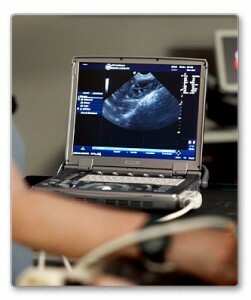 Pricing is important in our dog’s health care picture, but must be balanced with the quality of the care they receive. Many issues are preventable by good nutrition and weight management, but when our pets are ill or need routine preventative care, we are responsible for finding a good doctor to treat them. One of the most important things we can teach our dogs is a reliable recall. We practice and practice in our backyard when there are no distractions and it is an easy thing for them to run back to us since they know the territory and have nothing more interesting to distract them. Then, we take them to the soccer field to play Frisbee or the dog park where there are lots of fun things to see and smell, and they might act like they don’t know who we are when we ask them to return unless we have done some serious practice. And, I might add, some dogs are easier to teach reliable recall than others! In teaching recall, one of the things that is super important is that we always make it fun and rewarding for them to come to us. As puppies, if they don’t come when we call, we must make it a game and run away rather than toward them and act like our closest family member has just come home from Afghanistan when they finally “catch” us. We should NEVER punish a dog for not coming although I have done it in my distant past and paid the consequences of a dog that became a “runner”. Letting them drag a long lightweight “clothesline” when they are not quite dependable gives us the edge. We can just step on the end of the line when they start to dart, and reel them back in with lots of “good boys”. When working on recall, I try to keep a few of the very best “jackpot” treats in my pocket, ones that aren’t used for the usual sit and down and spin. It has to be something that they can smell from a distance and tastes scrumptious and is only used when what they are asked to do is especially tough. Since I get samples occasionally from chewy.com, I have decided one they have sent me would be excellent to use for training recall or to use a jackpot. Nature’s Variety Instinct Mini treats are freeze dried raw chicken so nothing but meat and natural ingredients as is typical of this company’s products. My dogs go crazy when I get out the box and if I have them in my pocket, they sniff and sniff at my side. I dare say, if I can them to “go out” at all, they will be quick to return if I have these little treats ready to pop in their mouth when they come back to me from a distance. 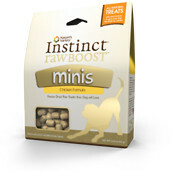 Nature’s Variety Instinct Raw Boost Minis are available from chewy.com with free shipping over $49. I do not receive any money for my reviews, although I do like to share products that I like and this company gives me the opportunity to receive samples for the reviews. If you’d like to subscribe to the Blog for email notifications when one is posted, click HERE. Your comments and experiences with your dogs are welcome! You can unsubscribe at any time. One of the fun parts of having that occasional litter of puppies is to stay in contact with the new owners and watch them grow into adults. Yesterday, Kelley and Mike stopped by on their way back to Nashville and let their little Phoebe have a visit with her brother Swagger and friend Rosie, as well as her doggy mom, Izzy. 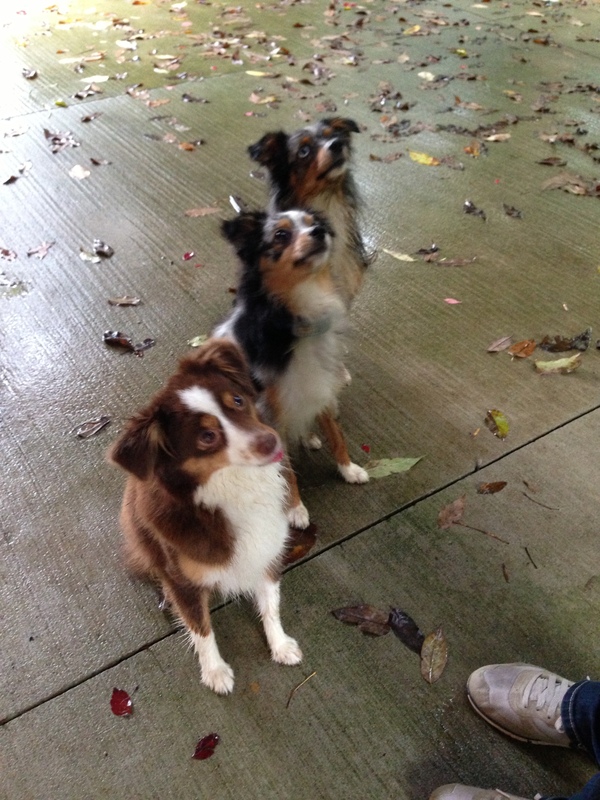 They had a good run in the yard, even though the rain was pelting down, and then sat pretty for a treat!! Phoebe is measured at 13.75″ and weighs in about 17 pounds at 18 months old. She is a gorgeous little Aussie with a sweet disposition and pretty bright colors like her brother. I was happy to see how she has developed. I am often asked the question about grooming my dogs and my reply is “seldom”. I do bathe them to keep them smelling sweet and their hair soft, but I don’t do much in the way of grooming except to keep down the straggles and to get ready for the show ring in which case I sometimes use a professional groomer. Aside from the above, I keep my dogs’ nails clipped regularly for a couple of reasons. First, I have hardwood floors and secondly, long nails are actually a detriment to a dog’s stability on their feet and can even be painful. I found some neat videos on YouTube to share and I have practiced on my dogs and like the recommended techniques. The two areas that I try to keep neat are the ears and pantaloons and watching the demonstration made clipping these areas easy. The videos are in five parts and I am linking to each one. Enjoy! It’s hard to believe that a year has passed and it will soon be time for Fancy to be bred for her 2013 puppies. She has had a nice break from motherhood this year and running the yard with Swagger and Rosie has toned up her muscles so she is nice and trim and healthy at about 22 pounds and will have her 4th birthday in November. If Fancy is on her usual schedule, she will be bred to Swagger in October for December 2013 puppies. This will be her third litter, but first for Swagger. I’m excited to see this cross. 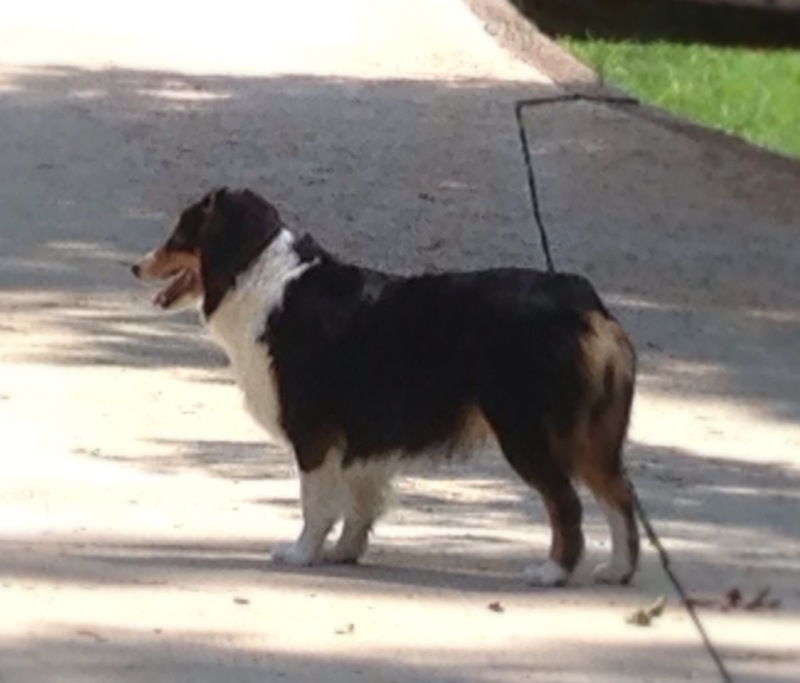 Fancy’s strong points are her nice Aussie conformation and bone and steady and friendly personality. Swagger is a smaller athletic dog with keen intelligence and has very bright merle colors to add to the mix. Both dogs have been in the show ring for their Int’l Championships as adults and have their health tests. They are registered NSDR as Miniature Australian Shepherds and AKC FSS as Miniature American Shepherds. Fancy’s last two litters are on my YouTube channel with a few pictures on the photo gallery page of my website and on the Alangus-Mini-Toy-Aussies Facebook Page . Lots of folks have inquired about this litter, and I will take deposits as soon as Fancy stands. The order that I receive deposits is the order that folks pick their puppies. I like to be sure everyone is healthy before I invite folks in to visit to choose their new playmate so typically wait until about 4-5 weeks. My puppies are weaned at about 6 weeks so they are ready for a vet check and shots at 7 weeks and are ready to move to their new homes around 8 weeks. As you can see, my dogs are our house pets and travel partners and I do not have a kennel so having puppies in the house occasionally is a bright spot in my year. 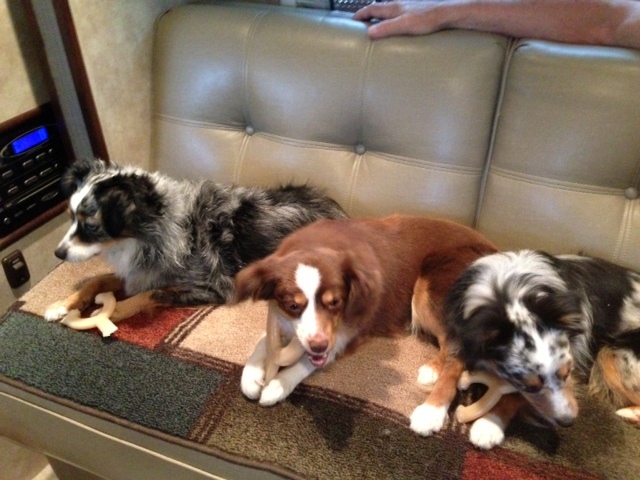 We just returned from 21 days on the road in our motor home with three of our dogs, Izzy, Rosie and Swagger. It was both an educational journey along the canals of the northeast and a fitness journey along the bike trails. If you’d like to read where we went and see a few pictures, the blog is posted at PACK EM UP. Our three smallest travel well and don’t take much space. We did start out the trip with Swagger not feeling so well. He has struggled off and on lately with stomach issues and I am doing trial and error to determine the trigger that is playing havoc with his digestion. I am slowly adding and deleting from his menu to determine the culprit of what seems to be Irritable Bowel Syndrome, either brought on by stress or what he eats or both. When I had his last bloodwork done, his liver enzymes were a bit elevated and the vet recommended putting him on Denosyl, a supplement which helps the liver to do its work properly. By the way, we ruled out all the parasitic causes of diarrhea first. My old standby for dogs with diarrhea is boiled chicken and rice for a few days but in Swagger’s case, that seemed to make him worse so I changed to lean hamburger (rinsed and drained) and rice. When I made that change and he improved overnight, a light bulb went off and I started to consider that he might not be tolerating chicken or chicken dog food well. Surprisingly, many dogs are “allergic” to chicken. Over the course of a few days, when I would add in a tad bit of chicken or a rich dog treat, he would start to have symptoms again. As always, I carry a variety of food with me when traveling, so along with the burger/rice mixture, I also gave him some canned lamb dog food (Solid Gold) which he tolerated well. I slowly moved on to Solid Gold Bison kibble and he was as good as new. A couple of weeks into a red meat only diet, he is feeling spunky and eating like a little Trojan, something he hasn’t done for awhile. I am continuing the Denosyl as recommended by the vet because as a supplement, it is a plus for dogs with or recovering from IBS. I also read on Dog Aware that probiotics are best given in the evening to help stomach flora replenish themselves overnight and prevent empty stomach nausea. I had always given them in the am, so I also made that change. For several years, I have used Dogzymes Digestive Enzymes from Nature’s Farmacy with my dogs and also with pet sit client dogs that had stress diarrhea when their owners were traveling. It is certainly too early to make a definitive diagnosis of intolerance of chicken or chicken products and may just be circumstantial, but for now, I’m playing it safe and letting him put on some needed weight with alternative protein sources. I’ll keep you posted on the long term outcome. Brags!! We returned from the IABCA Show in Atlanta with an Int’l CH title for Swagger!! This was his first time in the ring and I had no idea how he would perform. Yes, we had practiced, but practice isn’t the same as the environment of a dog show with dogs, some the size of ponies and some the size of rabbits, milling around and people everywhere surrounded by a cacophony of noises that even made me shutter. Barking, hair dryers, people cheering…all echoing off the walls. Then, add to that a floor as shiny as a mirror. Yikes!! An IABCA dog event spans over two days with four shows, morning and afternoon of each day. Each show is judged by a different judge and the dogs are rated on their conformation to their breed standard with one chosen as Best of Breed. An adult dog which receives the necessary points is awarded their title at the end of the two-day event. 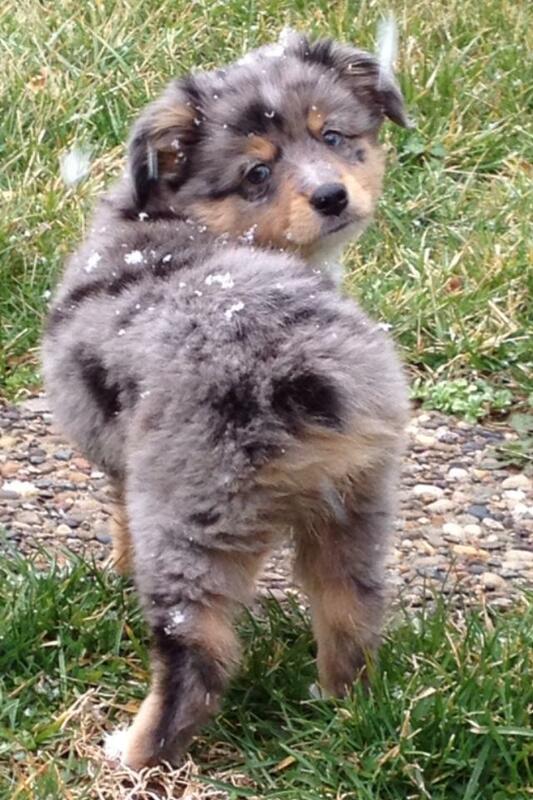 Swagger is registered as Miniature, but he is just under the 14″ measurement so he can show as a Toy Australian Shepherd. He is still young and as a male not totally developed at 18 months old. As he matures, we will repeat the process to move him up the ranks among his breed competitors. Admittedly, the first morning I was nervous and so was Swagger and it was not his best performance in the ring. He hesitated a bit as we made our debut to the conformation show circuit, but thanks to a very kind judge as you see in the picture above, he relaxed and decided he was “just fine”. On the table, he was a perfect gentleman as he was examined, teeth and private parts included. By the first afternoon show, it was old hat. The second morning, I really wondered if he would be anxious in a good way or a bad way as we went back into the building. Luckily, he was a happy camper and seemed to know exactly what was expected. By the second afternoon when he circled the ring and then posed himself in the lineup, he had a happy face as our admiring group cheered for him. Did he understand he was in the spotlight? He most certainly did! My dogs love to play and work and conformation showing is just the icing on the cake, but not the end of the story. It made me very happy that four professional conformation judges gave him accolades for his attitude and structure, but I know under that beauty is my little lapdog when it’s raining and my playmate when it’s sunny! You just can’t beat that! If you’d like to subscribe to the Blog for email notifications of new posts, click HERE. I like to take Fancy and Ike, my “big” little dogs around the two mile neighborhood loop at least once a day and morning is preferable for their walk. They think they are out for a hunt and it’s all business to them from start to finish. After the exercise, their day is much more relaxed as is mine. I am fortunate to live in an area where we can walk with the dogs safely. We have leash laws and our Animal Control facility is diligent about picking up loose or lost dogs and helping them to find their way back home, occasionally with a little reprimand for the owners. Plus, our traffic is minimal and we can make the loop with very few stops if we time it right. Today my thoughts were totally random, as they typically are, but as we were walking I had my headphones on and had chosen a station on my Iphone from the TuneIn Radio app. I don’t know why this appeals to me, but I think it is fun to listen to stations from around the country and this morning the call was 96.3 The Wolf. When I kept hearing “Anchorage”, I thought..hmmm…that’s not far from me, maybe 15 miles. But, when they gave the high temp today as 63, I realized, the music in my ear was being broadcast from Alaska which was a surprise. Isn’t technology amazing? I know that is a trite saying, but it really is amazing what information and media we have so easily at our discretion. The younger generation expects it all to work, the older generation is still amazed that it does. The pooches and I had a pleasant walk with the sun starting to shine after several days of gray skies summer and rain. The dogs probably could hear the beat of the country music from my ear buds and we were in step in more ways than just our feet. They didn’t care that a human + computer thousands of miles away programmed the music itinerary for this morning, but it gave me random food for thought. Walking for exercise and relaxation is good, life is good and dogs in step make it better. If you’d like to subscribe to the blog for email notifications, click HERE. Your comments and experiences with your dogs are welcome! I was mailed a sample of Orijen dog treats for review and frankly, my dogs LOVE them. The treats are small meatball size and can easily be divided into smaller pieces. They are not gooey so they do not make a mess in your treat bag and the high quality ingredients take away the guilt we might sometimes have “stuffing” treats into our dogs mouths each time they agree to do what we have asked when we are training. I shared with some other folks in my training class, and their response was the same…dogs love them. Orijen is a Canadian dog food company and I have purchased their products in the past by mail order although none of my local stores carry the brand. 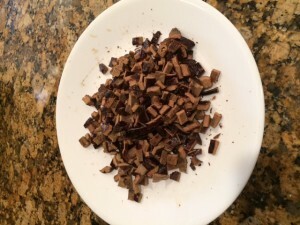 The food is given the highest rating on dogfoodanalysis.com and is very high calorie so even though a little pricey, the quantity you feed can be reduced making up for the difference. I especially like the food when my dams have a litter of puppies and they need the best I can give them. Chewy.com has good pricing, home delivery with free shipping on orders over $49 and no sales tax. If you are in an area where a variety of dog food brands are not available, or you just like coming home to a heavy bag of food on your doorstep rather than lugging it home from the store, this is an alternative. Alangus Aussies, Boarding Dogs, Mini Aussie Puppies, Miniature Australian Shepherds, Ultrasound Dogs Comments Off on Puppies—Drum Roll—-Yes or No? As you know, I like to breed my girls only once a year and Fancy’s turn doesn’t come about until Fall 2013. She gave us six healthy and beautiful puppies last Winter and I like to give her “time off” to just relax and play in between litters. Swagger, our little male, is coming into his own at just over a year old and it was questionable if he might have bred Fancy last month. We didn’t think so, then we thought so, and it was just a little iffy because there was that sneaky suspicion….. Fancy has been a little symptomatic by not eating like her usual chow hound self and that has always been a giveaway that she is having some morning sickness. So, I scheduled her ultrasound on Monday, and…..NO heartbeats to my relief. Summers are just very busy for me and for some reason I like winter puppies if I can work it out. Plus, the timing is good for them to go to their forever homes just as the weather turns to Spring. So, back on schedule, and Fancy will be bred again come October for December 2013 puppies if all goes as planned. I’m still holding my cards on Rosie for this year. Her little body is developing well, but I haven’t decided if I will breed her this go around. News on that later! For archives of my Blog articles, link to www.blog.alangusaussies.com and join us on Facebook at www.facebook.com/alangusaussies We’ll meet you there! I have a previous post about doggy diarrhea, but thought I’d pass along my recent experience. Swagger has been attending doggy daycare a couple of days a week plus training one night a week in agility and to help him get ready to go into the show ring in the near future. I added that so you’d know he has been out of my home environment a lot lately. About three weeks ago, he lost his appetite, but I thought it was just because I had a girl in season which isn’t unusual for the little man of the household. He hasn’t been a hearty eater anyway and was starting to look really thin…not good. As it always happens, his symptoms of bloody diarrhea and prolific vomiting started to show up on a Saturday afternoon after all the local vets were closed. I texted one of my contact vets and she didn’t seem concerned and just wanted me to hold food and give Pepcid and Pepto Bismol. Because I’ve been down this road occasionally, I knew it was more than just an upset stomach but did as she instructed. Sunday morning and things were much worse overnight. Poor little buddy was sick…very sick and those sad eyes were asking for help. Being Sunday….off we go to Blue Pearl, the emergency clinic in our neck of the woods for blood work and to be checked out. I was seeing $$$ of course. You guessed it….most likely good ole Giardia! A quick Google search will give you all the info you need about this stomach bug aka protozoa that is all around and sometimes populates inside our poor doggy’s gut (and ours eeek!) and makes them very sick. The biggest danger for Swagger was that he was thin at that point and could easily have become dehydrated, which luckily he didn’t. Giardia is very difficult for a vet to test for because of its life stages, so typically the symptoms tell the story after ruling out something worse like pancreatitis or ingesting a tennis ball! A diet of boiled chicken and rice along with a 5 day regimen of metronidazole did the trick. I keep that drug in my stash and could have saved a couple hundred dollars, but you know, it could have been something else and I just didn’t want to risk my little boy. All’s well that ends well! Within a few hours, Swagger had his swag back on and was yearning to frisbee and had emptied his food bowl, asking for a second helping. But metro is an antibiotic, so we all know it’s important to finish the round even if the pup is feeling better. I put in a call to my breeder friend who is my goto when I have a question and asked her protocol. She emailed me info that the metronidazole should be followed up with a 3 day round of fenbendazole (Safeguard) in the event the other drug didn’t clear the bad bugs from the system. I buy Safeguard at Tractor Supply and use for worming my young puppies and also every 3 months with my adult dogs. It had been 3 months so it was time for a round anyway. Giardia is very contagious, so I dosed everyone as a preventive and also to clear any worms that might be hanging around. In my case, I had everything I needed for Swagger in my medicine cabinet but given the same symptoms again, I’d most likely make the same call for a vet’s advice. It’s good to look back and say that was nothing serious and I’ll know next time. Then the next time, when the symptoms show up, I second guess myself and start to worry that it could be more…and it always could. I’m pretty confident with my dogs and their glitches and upsets, but never confident enough that I don’t seek a professional when it’s warranted. There are so many ways to train our dogs, some formal and some quite informal. In fact, every moment we spend with them, we are training in some way because we are constantly sending them signals and they are responding. I train formally at Almost Home Boarding and Training on Dorsey Lane in Louisville. Since I have five dogs, it’s difficult for me to decide who gets to go to classes, but Izzy, my little blue merle girl is often chosen. Just because. Just because she so loves to work. Just because she needs to work. Just because she has a fear factor that I am working hard to resolve with her. 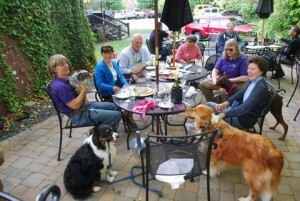 Once a week, a group of five owners and five dogs of all sizes and personalities meet for “class” led by Almost Home owner and APDT certified trainer, Katie Peckenpaugh. It is an ongoing class unlike most that are limited to a number of sessions. I have been a member of the group for a few months, but others have been meeting for much longer. We have worked on a variety of activities to stimulate the dogs to think and be a partner with us. On some nights, we practice basic obedience like long sits or stays and recall exercises using both verbal and non verbal signals. Other times, we are greeted with a Rally or Agility course to run through. The variety is fun for the dogs and for us. Since the weather is now nicer, the last two meetings have been outdoor adventures with our dogs. Last week, we all met at a local walking trail and worked on heel exercises, keeping our dogs focused on us while meeting other dogs, people and even children romping and playing. The treat, however, came last night when one of our members arranged for us to meet at a local restaurant, Selenas, for dinner with our dogs on the patio. What a pleasure on a nice Spring evening to eat a delicious meal and enjoy visiting with new friends while being accompanied by our fur babies! Dog training at its best is evaluating our dog and our interactions with our dog and giving them the opportunity to succeed. Why do I so enjoy this? Just because. Just because I love to work with my dog. Just because I need to work with my dog to build a better relationship. Just because I also sometimes have factors that I need to resolve which affect how my dog responds and the quality of their life. Note on picture: Izzy is in trainer’s lap rather than under the table and one owner is our photographer so not pictured. The group consists of Izzy, a mini Aussie; Naylan, a Corgi; Sam, a Collie; Sonny, an Aussie; and Claire, a Doberman. Should we microchip our dogs? My unequivocal answer is yes! Yesterday, I was in the small town near where I live and a little Wheaten Terrier ran up to me and begged for some attention. No collar, no tags and obviously someone’s pet although she needed a good grooming. She was as thirsty as could be…hmmmm…I wondered who owned her and let her run lose to be hit by a car. After asking around with folks I knew nearby and getting no information, I packed her up into the kennel in my van (and her willingly) and took her to our Animal Control office. When she was scanned, she did have a microchip! Hooray! Now the bad news. When I called to check on her today, she was still there because the phone number listed on her Home Again chip was an answering machine and no one had called back. The question, where had the system failed because the chip identified the dog’s owners. 1–Was the owner on vacation or in the hospital and a neighbor or family member let her out to roam? 2-Did the family fail to update their phone number at the Home Again website when they moved? 3-Or, did the owners, just not care about her?? Unlikely, because she was a chubby missus. It could be any of the three answers or others, but the chip did at least give an owner’s phone number and name so it served its purpose. The fault was on the owner’s side, no doubt. Luckily, our Animal Control is a no-kill shelter, has a universal chip reader, and even enters screened dogs into the training program at Kentucky State Penitentiary. If no one claims her within the week, I’ll bet she is inducted into the program before being rehomed. Even though a sad ending in some ways, it could have been much worse. You can visit our blog archives at blog.alangusaussies.com or our website at www.alangusaussies.com. Raising an Australian Shepherd–No Matter How Tall! Alangus Aussies, Dog Instinct, Helpful hints for dogs, Miniature American Shepherd, Miniature Australian Shepherds, Raising an Australian Shepherd Comments Off on Raising an Australian Shepherd–No Matter How Tall! This is posted with permission of the author. It is the best description of Aussies that I have ever seen and a printed and marked up copy will remind me of my oversights with these intelligent dogs and prompt me to keep working to do better as I bring along puppies to adulthood. Fourteen or fifteen years with an animal as part of our home culture is a long time. They walk with us through some bad times and hopefully many good times. Yesterday, my daughter came home from her rounds at the clinic to find that her old Aussie, 15 years old next month, had had a seizure and the hard decision of timing was just a tad easier. We all struggle with how long to let our old dogs continue living, even when they have lost their senses of sight and hearing and aren’t the alert and happy companions that we remember. When saying goodbye, we remember the many gifts they have given us. Jazz was a surprise from me when my daughter was in college and had moved from an apartment to her first house at age 20. I already had an Aussie and had fallen in love with the breed. I didn’t do much homework except to look in the Lexington Herald Leader and found a farmer in Berea with some fuzzy little puppies in his barn. Not at all the way I’d do it now, but the wormy and scruffy little puppy rode with me back to Lexington to make that house a home and to follow my daughter through future moves from Lexington to Cincinnati to Florida and back to Lexington and walk many miles beside her as her friend and guardian. Jazz accepted the entrance of babies into the household and a husband that is more fond of cats, all with grace. When talking to my grandchildren about Jazz becoming old and imminent death, the 3 year old was very accepting of the idea of doggy heaven and who Jazz would play with there. She was just sure that Jazz would like to chase Grayson, my departed cat, all around the place, but then she’s a cat and it seems she just comes over to play sometimes. In her innocence, she asked some very good questions and gave me the chance to introduce the importance of loving and being a good friend, whether it be person or animal. Into the picture waddles a little blue merle puppy, named Brave, who will fill the void that the loss left. She is not her predecessor, but she will make her own memories in the next years as she stands by while the girls grow up and perhaps see them move away to college. What a gift our dogs are to us, they make us smile and when they pass, they bring back all the memories of those days they shared with us. The plan was well written. Enjoy the video that was shared with me, On the 9th day, God made a Dog. I’m hearing lots of good reports from this last litter of Fancy x Randy puppies. C from Western KY sent me videos of Kobe aka Target already chasing Frisbee rollers and doing multiple parlor tricks at 9 weeks old. It’s not surprising because both mom and dad of this litter are very intelligent and eager to please. You can view one of the short videos at http://www.youtube.com/watch?v=eTAsNjovRrA. Puppies learn very quickly with yummy treats and positive reinforcement. Notice C uses the word “yes” or “good boy” as the marker to let Kobe know he has accomplished what she asked him to do and then popped him a “yummy”. Petey aka Shadow stayed here close to me and I hear he is a snuggle bunny loving his bubble baths and is sleeping the night through. Puppies that get plenty of exercise, both physical and mental, are tired by evening and if c rated, will rest peacefully. I couldn’t resist posting the pictures M & G sent because there is just nothing cuter than a little Aussie behind at 9 weeks old. Petey will be starting puppy classes at Almost Home in Louisville soon. Little Kona aka Tardy had to travel far to her home near Cleveland. I hear she is also doing really well with her potty training and loves to play ball. What Aussie doesn’t like to play ball?? All they have to do is train us to toss it and we humans are pretty quick to learn we are rewarded with puppy kisses if we do what we’re told. I have had emails from both Corky and Storm that stayed in Louisville, and will post some pictures when I get them. And…last…little Brave ended up staying in the family here. She, of course, was the puppy that my granddaughter named from the Disney movie and she managed to convince her skin daddy that the puppy was meant to be hers. At three years old, I’d say she can convince her daddy of about anything with either a pout or a little girl hug 🙂 The only caveat was that grandmommy keep her until she is potty trained and just a little less fragile for a life with toddlers. Potty training is going quite well with very few mistakes (which are mine in most cases) so only the second stipulation is pending. Another sweet group of puppies in their forever homes and we’ll continue to share pictures and stories as they grow. It is so rewarding to see others enjoy the little Aussies the same way I do. They are just a special breed and their nickname “velcro dog” is very suitable. Corky, one of the black tri male puppies from Fancy x Randy litter of December 16, 2012, is still available for a forever home. At his 7-week old vet check today, he weighed in at 4.6 pounds and is a healthy little boy. He has a funny and happy personality, not afraid, and ready to play. Additional info at Alangus Aussies. Click to enlarge pictures. Today is photo shoot day and luckily, the puppies were fairly cooperative. I was playing around a bit with my camera with lighting and poses and got some fairly good shots between eating, playtime and naps. I admit photographing 4-5 week old puppies without someone to assist requires some time and patience. Let’s just say I had a nice number of “not so good” ones and had to work in short intervals. The eye color is fairly distinct in these photos with the exception of Shadow and I had him facing the light so his pupils were dilated. He and Brave both have blue eyes. It is still possible that Tardy might be partially blue which sometimes happens with merles. Their eyes carry the same merling pigment as their coats and can be multi-colored. All but one of these puppies has deposits, and it’s still a mystery who is behind Door #6! I will revise the Blog as folks make their selections. The excitement is building!! Fancy x Randy December 2012 litter of Miniature Australian Shepherds at 2 weeks old. Left to right: Brave, Target (under), Tardy, Corky (over), Shadow, Storm. Puppies typically open their eyes and ears at about two weeks old, and these are no exception. Yesterday, I could see just a glimpse of eyes through the slits and today all but Tardy have them wide open. By evening or tomorrow, hers will be open as well. Notice the ears have laid down against the puppy heads since the individual pictures which tells us they are also starting to hear the sounds of their world. It is amazing the progress puppies make in their first two weeks, from residing in a bubble of embryonic fluid, to testing their legs for wobbly steps, nibbling on their siblings’ ears, and even sometimes a little squeaky bark while dreaming of chasing a future Frisbee. There’s a world of fun in that POP (pile of puppies) and enough love to make 6 families a lifetime friend! Of course, these puppies will most likely get new names when they go to their forever homes, but we need to identify them and we have a good time giving them nicknames while they spend their first eight weeks with us. I mentioned Tardy (the puppy born 3 hours late) in my earlier post, but misrepresented “her” as a “him”. Right now she is the biggest puppy and it will be interesting to see if that continues. The position in the uterus often determines the amount of nutrients the embryo is getting and she may have just been a mainliner right to her mom giving her a head start…or she may be a bigger adult. Tardy is a blue merle female with a very nice wide white half collar and split lower face, half white and half merle. The second blu e merle female has been nicknamed Brave, thanks to our 3 year old granddaughter who recently went to see the movie with her Uncle. Of course, she wanted all the puppies to have prince and princess names, but we are straying a bit. Brave has bright colors and will be striking. The darkest of the blue merle puppies, Shadow, is a male. He has a white blaze on his face and white socks, but no collar. I’m thinking he may be the darker color of his sire when he matures with just a bit less white. One of the black tri males has a unique marking on his underside. His white belly has a small black circle in the center, so we’re calling him Target. He’s a cutie pie with a white blaze on his face. He was a little grumpy after his tail dock, but was back in good form today. He has nice symetrical white markings on his face which typically enlarge some as they mature. The black tri female’s white blaze is in the shape of a lightning symbol so she is now called Storm. It was pouring rain, after all, in the North Carolina valley when the puppies were born so her name is quite appropriate. She also has split color on her muzzle. At one week old, the puppies seem to be thriving and I can hardly keep my hands off them. Their little ears and eyes are shut tight for another week or so, so their world is quiet and dark as they snuggle into their mommy’s soft belly and peep occasionally in their sleep to show their contentment. Here is a candid shot of the Fancy x Randy December 16, 2012 babies after their “de-tailing” (tail docks) at five days old. We decided to load up the motorhome and start the trek home to Kentucky from Hilton Head Island on Sunday, December 16 since Fancy seemed to be holding stable. She had held off, so we had our fingers crossed that perhaps her body was telling her to wait for her own bed and safety zone. Of course…not to be and as I originally predicted..day 74 from first show, the exact same time interlude as her litter in 2011. We stopped for the night in Maggie Valley, NC at the base of the Smokey Mountains in the campground we typically use when traveling on I-40, Creekwood Farm RV Park. It was pouring rain, so luckily we stopped a little early, around 6 pm. By 8, Fancy was panting and pacing and crying just a little and there was no doubt, it was happening. I gathered all the supplies and we got ourselves set to help her and for an all-night stint. Why is it that it always starts just at bedtime? At 9:15, the first puppy appeared and struggled a bit to finish its entry into the world. We cut the cord and helped it along and found the reason it was hanging back was that two puppies were trying to come down the chute at the same time. Oops, one at a time please! Things progressed well, with just a few glitches, but nothing serious. By 2 am, we had 5 puppies and since the ultra sound had shown 5 heartbeats, our sigh of relief could be heard through the valley. We straightened up the supplies and Paul went to bed and I stayed on the couch so I could monitor. At about 4 am, the babies were squeaking a bit and I woke from my coma to check on them and found another baby entering the world. Oh My!!! The little blue merle boy was the biggest of the lot and ready for milk right now, or yesterday even! Paul says this one should be named “Tardy” 🙂 We ended the night with 3 girls and 3 boys, 3 black tris and 3 blue merles. Because I’m one to try to be as prepared as possible, I had already gathered vet info for the area and set my alarm for 730 am. I wasn’t sure the last placenta delivered and Fancy hadn’t totally settled as mamas usually do after whelping, so I called a local vet office to ask about an Oxytocin clean out shot for her. My local vet felt like I shouldn’t risk waiting just in case because of the possibility of infection or even another puppy. Dr. Gibson at Animal Hospital of Waynesville was so helpful and worked us into her schedule for the morning, something a lot of veterinarians just won’t do, especially for a traveler that will probably never be back. X-rays and an exam didn’t indicate problems, but we opted for the clean out shot and a round of antibiotics. We then loaded up to continue our ride back toward LaGrange Kentucky. The shot gave Fancy a little discomfort because just like a similar drug for laboring people, it “induced” contractions to push out any residue that might need to be released. Within the hour, she was obviously feeling better and laid down quietly to snuggle her new family. The puppies had already nursed non stop for 12 hours and their little flat bellies had rounded out and little squeaks of content could be heard on occasion. I can’t help but interject Paul and my discussion here as we drove down the road with mama and 6 sweet little Mini Aussie puppies. The production of a new living being is a miraculous event whether it be an animal or our more precious skin children. There is just no way it could be a random freak of nature coming about with so much precision and in such a complicated way. Fancy is a wonderful mom to her babies and once settled into her x-pen in our sun room, she is just relaxing and making milk to feed six hungry little mouths. We had a very nice vacation with our daughter, son-in-law and grandchildren and our “fancy girl” but coming home is always sweet. We had missed our pooches left behind with the petsitter on this trip. Stay tuned for updates on these puppies! Additional info can be found at my website www.alangusaussies.com. We’ve been on a little journey in our motorhome down to Hilton Head Island, and as my tagline says “pack ’em up and take ’em along”, we packed Fancy in for the ride while the rest of the pack hung back with the pet sitter. Fancy is due to have her puppies at any time and I didn’t want to leave her behind nor did we want her to have the other dogs for company. Today is day 73 since her first show. I’m counting from that date rather than breeding because the count of 63 days actually begins from ovulation and since I didn’t do progesterone testing, I’m not sure that exact time. Last year, Fancy whelped on her 74th day from show. Since her temperature is 98.6 this morning, we should be seeing puppies very soon! This is the time when I get nervous for the waiting. As an aside, this is our first trip to Hilton Head and it is a very neat place, not your typical beachy community because of the regulations on the island to preserve nature, limited signage and lighting, and the miles of bike trails to discourage unnecessary use of cars. If you’d like to view info on the property in Historic Sea Pines Plantation that they have purchased for your next vacation, the “rough and unedited” webpage is up at Hilton Head Island Vacation Rental. As with all of you, life happens, and I have been busy, too busy to do much formal training with my dogs other than puppy classes in the last year or so. I’ve gotten rusty, and so have they. Determined to get back into the circuit, I registered Izzy, my prima donna, for an advanced obedience class which started last night. Izzy has not been in class for a couple of years during which time she has given us two nice litters of puppies. She has now been spayed so it is time to let her shine once again. Every household has a dog that is the “straight A” student, and Izzy is ours. She is so in tune, it is pretty impressive and she LOVES to work. I have as a goal to ready her to go into the competitive obedience ring at some point. Since we are a partnership, I have to fine tune my skills while she does the same. I have found that I can obviously practice at home, but the training class setting is important. Izzy struggles with her confidence around boisterous dogs and animated people and tends to over react to “scare” them away. Because of that personality trait, the time among the other dogs is very very important for her. As she works, she zeros in on me and forgets all the chaos around her. The biggest obstacle to attending class is drive time for me, but I am very happy with the trainers and nice facility at Almost Home Training in Louisville, KY. I like to understudy those that have had competitive experience because they have an edge over those that have not been in the ring because they haven’t just read the books, they’ve done it themselves. If you haven’t taken your dogs to training classes, you’ll find it is addictive and the pride you feel when your dog accomplishes a new skill is just plain fun. An examination by a board certified veterinary ophthalmologist is one of the health exams that we use at Alangus Mini & Toy Aussies. Eye exams are much like the ones that we have as humans and start with a visual exam with a lighted magnifying instrument to look for lesions or anomalies on the surface of the eye. After the eyes are dilated, the doctor can look for additional issues like cataracts that might be heritable to the next generation. All of my adult dogs have been certified by CERF and Swagger and Rosie just “passed” their test which is one more check mark on their list of health clearances. To read our Blog Archives on a variety of topics, visit blog.alangusaussies.com and we welcome your comments and contributions to our discussion. I see a lot of animals in my walk of life, as do you. I also see a lot of fat cats and fat dogs and I cringe because I know these animals are loved…loved sometimes to their early death by overfeeding. Fat is not beautiful when it comes to our pets. From a health standpoint, an animal that is overweight has a high risk for diabetes, hip and joint issues, tumors and cancer. In addition, they just simply don’t feel as good, just like us when we put on a few extra pounds. If you can’t see an indention at your dog or cat’s waistline or their belly is rounded, it is very likely they are carrying extra pounds that are affecting their well being. Some of the habits I notice that lead to an animal being overweight are simple to correct and since we are their caretakers, it is our obligation to do better. Feed a premium food where meat is the first product and avoid colored kibble and corn or cornmeal or sugar as an ingredient. Do NOT free feed. Do you carry around a bag of corn chips to munch on 24/7? Read the suggested measurement on the bag for the weight of your animal. Be careful to use the weight the dog or cat SHOULD be, not what they actually weigh. Go with the lowest amount on the list for the weight to start. Just because it doesn’t “look” to be enough, doesn’t mean it isn’t. If you change foods, adjust the amount to the new chart. Some foods, because of their high meat content, require less each feeding. The chart on the bag is for a day, not each feeding. Use a correct measuring scoop and make it level not rounded when you measure the food. If you use a “cup” scoop and you are to only feed 1/3 cup, I’ll bet you overdo it and the few extra calories each meal adds up over time. Raw carrots and raw or canned unsalted green beans are low fat snacks that dogs love if you feel they need more food..mostly to make you feel better. If you feed table food, reduce the amount of dog food or don’t give any at all that day and remember our table food is usually high calorie. And, of course, your animal should get exercise, even if you don’t. I can only imagine how veterinarians are distressed when we bring in a fat animal with health issues that are brought on by something as simple as our “feeding them to death”. They try to tell us without making us defensive, but we often have all kinds of arguments and go on about our bad habits. Too bad, because veterinary care is expensive and none of us want to lose our pet to a disease that is preventable. Let’s do our part to keep our pets lean and healthy for many years to come! 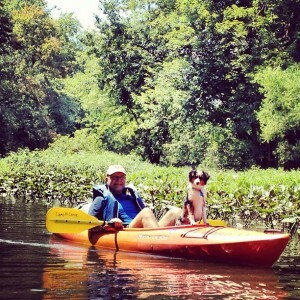 I am an advocate for training our dogs because it is just plain fun, fun for us, fun for the dog. A dog trainer friend of mine quietly handed me a new book a couple of weeks ago and now I realize there was a spark in her eye and a hidden smile as she passed it to me. The name of the book is Reaching the Animal Mind by Karen Pryor. Ms. Pryor was a pioneer in the use of markers (whistles and clickers) first with dolphins and then zoo animals and later dogs as she did research for her study of behavioral biology. Because she is a professional, it might seem that the book would be a heavy read. However, it is very interesting. Of course there are lots of examples of her dolphin research and zoo animal consultations but it is written in layman’s terms with lots of entertaining stories. I dug out my clickers , stuck some kibble in my pockets and decided there are some behaviors in my pack that are annoying me so they are my target for the next few days or weeks. Clicker training is to help dogs learn new “tricks” but also to eradicate bad habits by clicking and treating them to extinction. Ike, my 7 year old mini male, who I mention in my blog often can be a nervous barker when he feels stressed. He also spins when excited, sometimes until he makes himself a little frantic. He has been my first target to click and treat him when he’s in a calm state, and as he practices the basic obedience commands that he already knows. In his excitement, he also likes to jump on us as we come inside or just to get our attention so I’m also clicking and treating him when his all fours are on the floor. He knows the words or commands but the click does something to the doggy brain that just the words cannot do. It’s really interesting to see the difference that the clicker makes even over using a marker word like “yes” or “good”. I am already seeing a change in his demeanor. He’s a good boy but needs some tweaking. Swagger, my little boy learned when he was a baby that his shrill little barks got him picked up, got him on and off the couch, got him out of his crate, etc. In other words his cuteness and a little noise got him whatever he pleased. Well, it’s overdue to extinguish the woofs and replace with other more acceptable behaviors to indicate what he wants or needs. I can’t blame him because dogs do whatever we reinforce and what works…like our children!! You get the idea! Training is ongoing and requires short spurts of time each day to work best. When we get lazy, our dogs get lazy as well or into habits that we don’t like. Smart dogs need to be challenged to be at the top of their game. I now have have five dogs at my house, one neutered male, one in-tact male puppy, one spayed female and two in-tact females. It is a mix of sizes from 12-28 pounds and personalities. My dogs have a definite pecking order and as I have written before, it is quite interesting to observe, fun actually. In my “before Mini Aussie life”, I owned a spayed female German Shepherd and at the same time, a spayed standard Aussie. Both were beloved pets and lived long lives, past 14 years for my Shepherd and past 16 for my Aussie. However, 12 of those years, those two dogs could not be in the backyard together, much less the same room or we would have an instant dog fight to the death of most likely the smaller dog. They started out as good friends, with my Aussie raised from a puppy and the Shepherd added two years later also as a puppy. All was well until the Shepherd reached maturity and one morning when I was letting the dogs back into the house from their potty time, a voracious fight ensued at my back door. Luckily, I had pepper spray on my counter and let them both have it because I was otherwise defenseless and knew my Aussie was going to die. My Aussie girl did not have the personality to cry “uncle” and my Shepherd out weighed her by 25 pounds. I have to admit that perhaps I triggered the scuffle, but body language is so subtle, I don’t know for sure what I did because it was like every other morning as I was leaving for work. I was in a rush and had the day on my mind. A few months later, the second fight occurred with totally different circumstances. This time, I was not in sight but heard their “noise” in the back yard and quickly dumped a bucket of water on them to break up the argument. From that date on, our house became one of two separate dog apartments. Both got people time and training. Both were loved for the next 12 years. But there was no way I was going to let them together in my presence because it was so traumatic for me that I knew they would sense my insecurity and both were large dogs with the ability to do damage, even to me, if their aggression to each other might be redirected. I’ve had dogs all my adult life and once again I’m managing a multiple dog household, but it is totally different. Now, my dogs are small enough that scuffles are easily handled. Second, I know much more about dog psychology and pack behavior so hopefully, I can forgo the extreme situation from before by better understanding what exacerbates a playful wrestling match into a real fight. I might add that although I dearly loved my German Shepherd and she was better than ADT for keeping intruders away from our home, I would be hesitant to own another female of that breed because of their tendency to be argumentative with other dogs. She was very people friendly, but never saw another dog she didn’t hate. Because I do not have contact information for Ms. Chong to ask her permission to post her text, but you can copy the link into your browser to read. The article is simple and makes perfect sense. One of my adult females is with another breeder today, my two young ones are at doggy day camp so only two of my five are at home with me. I miss part of my pack and will be glad to have them all back home again. Yes, it can be loud when they are all bebopping around, but we have a lot of fun! Phoebe is relaxing with her nose in mommy’s shoe and Addie is putting the move on the flying disc. Both are 6 months old and showing that little Aussies love to play, but also know how to chill when the time is right. These two pictures are of the girls from Izzy’s April 2012 litter. I have discussed the “puppy uglies” where the babies lose their fat little faces and tummies and puppy fur and grow long legs and out of proportion bodies. At about 6 months old, everything starts to catch up. Adult fur comes in along with those last canine teeth and bodies start to fill out with some bulk, catching up to the appendages. Those of us that have hidden our adolescent dogs away for a couple of months or tried to explain to gawkers why they are scraggly can now start to take pictures and show them off again. It only gets better from here! Puppies continue to develop past their first birthday although smaller dogs get their growth sooner than large breeds. If you are interested in Addie’s ability to fly high and catch the Frisbee, post a comment or question and her owner can explain his methodology to get her to this point so young. Alangus Aussies, Helpful hints for dogs, HomeAgain, Lost Dog, Microchip Dog, Miniature Australian Shepherds Comments Off on Should I Microchip My Dog? Because I am a pet sitter and I’m out in neighborhoods on a daily basis, I often see dogs roaming around with their owner’s blessings. I won’t sermonize that issue, but would like to relay my experience with micro chipped and non-micro chipped dogs. I was doing vacation visits for a client’s dogs and at each visit I was greeted by a friendly English Shepherd just wanting some attention. I didn’t think much of it for the first 3-4 times, then I began to wonder if the dog might be lost so I visited several houses on the adjoining streets and was told the dog was new to the area and wandering. I made sure she had some water and continued on my way. It became obvious the dog was scavenging and was hungry, so I decided the next day to put her in the kennel in my car and have the local vet check for a microchip to find the owner. No luck, so she went home with me for the night. She was obviously crate and potty trained so I knew someone had to be missing her. I took her to our local Animal Control which is a no kill shelter and they checked again for a chip. The story does have a sad and a happy ending, but not as you’d expect. She was never reunited with her owner because they couldn’t be found, but she was placed in the prison training program at Kentucky State Prison and after the time there was adopted into a loving home where she would be kept contained and safe. The second story is more personal. My parents live on a farm in rural southern Kentucky. Dad was driving down the road to his barn and saw a little dog sitting on the side of the road and being a dog lover like me, he stopped and checked him out. When he opened the truck door, in hopped a little Miniature Schnauzer, freshly groomed and sweet as could be. Once again, Dad took now “Ralphie” to the vet to be scanned for a chip and also advertised in the local newspapers and on the radio for the owner to possibly retrieve their pet. No luck. There was no doubt, Ralphie belonged to someone and had been well cared for…but he was a runner, and a dog that gets on a scent and runs can actually go miles and then be disoriented and totally lost. Dad fell in love with Ralphie and he now is pampered. Another sad but happy ending because the owners could not be identified. He continues to have that will to “run” so has to be walked on a leash or kept inside. The third story has a totally different ending. I was driving on a two lane road near my home and came upon a dog laying in the road that had been hit and killed by a car and his buddy was standing watch over the friend he had lost. I zoomed in a driveway to keep the second dog from being hit and slipped a lead on him and put him in my kennel once again. This time, the remaining dog had a HomeAgain tag on his collar indicating he was micro chipped. It wasn’t necessary to have him scanned, but I just called the HA phone number and they contacted the owner who called me. I was able to return the dog to his owners who lived nearby. In this case, they were new to the community and the children let the dogs out without their electronic fence collars and they wandered away to the busy highway. As you know by reading, had the tag been gone, I would have had the dog checked and it would have led me to the owners. My dogs wear collars and also tags with my phone numbers most of the time. However, there are certain instances where I have their collars off and there is always the possibility the collars or tags can be lost. All five of my dogs have a microchip although I know it is no guarantee they would be returned to me. People are sometimes unethical and would keep or resell a nice dog or would never think to have it scanned. However, I feel better knowing the chip is there and if they did end up at a vet’s office or animal facility, the chances are good I could be notified. I personally have my vets insert HomeAgain chips and have all my data in their online system (free) so I can keep it updated should I move or change my phone number. The information is only worthwhile if it is correct. They do have a yearly fee for the “extras” but I have never subscribed. HA chips can be read by their proprietary scanners or by the universal scanners that many veterinarians and animal control officers now use. A local vet gave me some additional information which made me even more proactive. Vets that do use the HomeAgain chips have been provided with universal scanners which will read all brands of chips and the office was given a list of companies and the code system for their numbers so it helps to further trace the owner directly by the brand chip the animal has. This particular vet said they scan and identify owners for approximately one dog per week, and knowing they are only one of several vets in my area, this seems significant. It may be a false sense of security, but I do feel better having my dogs micro chipped and it is inexpensive insurance. Luckily, my Iphone and Ipad can now be located with GPS as well. Now, I just need to find a way to keep from losing my glasses! 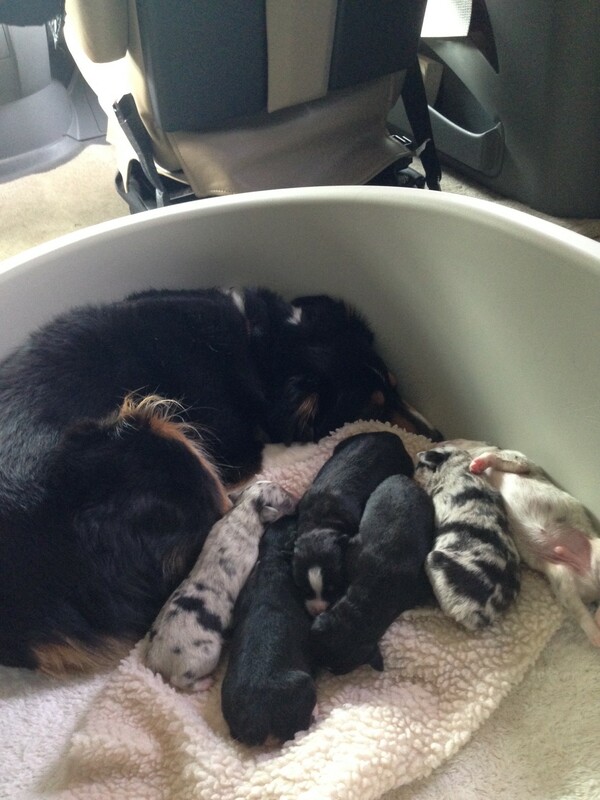 Izzy, our blue merle mini Aussie just turned four last week and has given us two very nice litters of puppies. However, she struggles to whelp and when her last litter had to be taken by C-section, I determined to have her spayed after her recovery period of a few months. The vet that performed the section did not advocate a spay during delivery because of the risk of bleeding and extra stress on her with nursing babies. Our dogs are first and foremost our companions. Izzy had the normal pre-op fast and she went in early in the morning for her surgery so she would have the day to recover before closing time. I chose to have the additional blood work done to ensure her safety and also to have pain meds administered. The vet I used called me after blood work and again at the end of the surgery because she knows I’m a worrier. Izzy did great with no complications during the procedure to remove both her ovaries and uterus. My vet is a traditionalist although she does use glue in lieu of sutures that have to be removed. I know in some clinics, laser procedures are being done and I read it speeds recovery time. Because I’m relatively dog smart, the doc sent her home to my care by noon instead of keeping her the full day. She was still groggy and glassy eyed, but walked out on her own steam. When we got home, I gave her the chance to get a little drink and then I put her in her crate away from my other dogs to sleep it off. I withheld food and water to prevent her getting sick. By late afternoon, she was ready for a small meal and a drink. I took her out to potty and then back to her safe place. She was still feeling sleepy. I remembered that she had had antibiotics so I gave her some probiotics to help her stomach flora stay balanced. The evening came and went and she slept all night in her crate by our bed. By morning, she was her tail waggin, bebopping self. I continued to walk her on leash and limit her jumping for another couple of days, but by day 3, I just let her be. Her 1-1/2″ incision looked good and she was not licking or bothering it at all. My vet did not mention her wearing a cone, although I know some do. In her case, it was not necessary. I have to admit that I’m sad to know that Izzy will not be able to produce any more babies, but I do have Swagger as her progeny and to keep her intelligent bloodline. I’m sure she will continue to help me train any new puppies that come along. She has a way with them to teach them manners without intimidation. It is advisable to have your dog spayed or neutered unless you intend to breed them, and then only if you understand all the ramifications of a breeding program. Having a female dog in heat is quite a nuisance for 3 weeks about every 6 months and unplanned litters are nothing to scoff at. All the females I have owned over my 40 years of having dogs have been spayed except for the two that I will now be breeding, Fancy and Rosie. Recovery time is minimal as is the expense, even for worriers like me.